Hello there! It's Andreea and I am delighted to be guesting today with the KGC talented team. Even more so happy to be joining their efforts for raising breast cancer awareness, during this October month. This is why the project I am sharing with you today it is colored in pink. 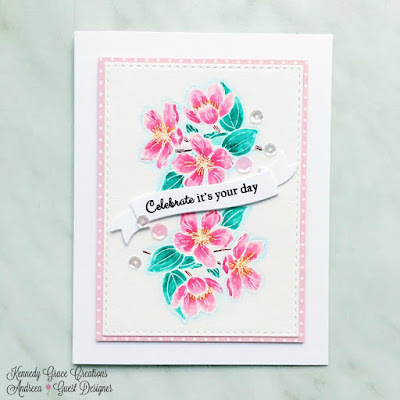 I used one of the beautiful flowers in "Grace's little note" stamp set, which I stamped on watercolor paper with Versamark ink. It stamped beautifully and I embossed it using white embossing powder, by Hero Arts. I colored the flowers with my zig clean color brush markers, using different shades of pink. I used a stitched rectangle frame die to cut the main panel. 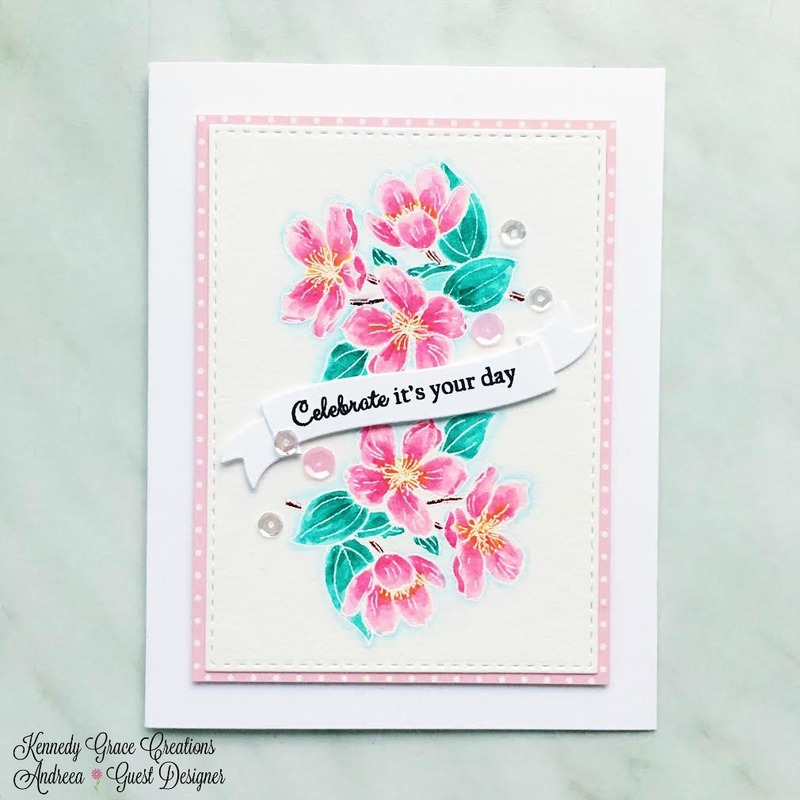 I do need a few birthday cards this month, so the "celebrate your day" sentiment, part of the same stamp set, worked perfectly. I stamped the sentiment on a banner die cut using the Simon Says Stamp die. I sprinkled a few pink and clear Kennedy Grace Creations sequins on the main panel, for a bit of more "festive" look. I felt like my panel needed a frame, so I thought a pink shade polka dot paper will create a nice little background frame for our panel, so I added this paper before adhering it to the card base, using some dimensional foam. Thank you for having me on the blog today! Have a wonderful day and don't forget to have your checks done. Welcome Andreea! Love how you embossed it with white and it looks like no line coloring! Great job and love your card!